The point shouldn't need to be made that all people share the same fundamental experiences – struggles, sorrows, pleasures, joys. But we live in a world saturated by propaganda, much of it devoted to demonizing other countries to ease the path to war. Iran, one of the world's oldest civilizations, has since 1979 been characterized as irrational and aggressive, and now stands in in the cross-hairs for a probable military attack. 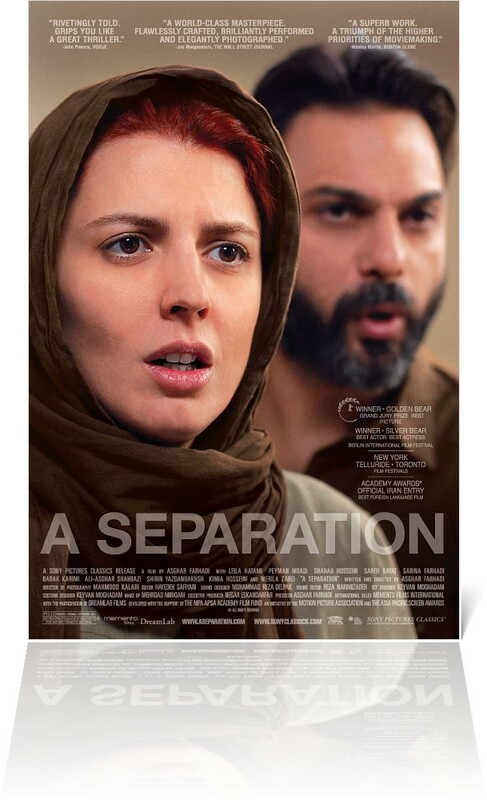 The powerful Iranian drama A SEPARATION, written and directed by the talented Asghar Farhadi, provides a welcome human counterbalance to the disinformation campaign. 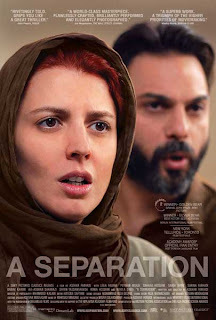 The film, whose Persian title translates to Nader and Simin, A Separation, has won numerous awards and is an Academy Award nominee in the foreign-language and original screenplay categories. A family court judge rejects Simin's divorce application, so she leaves the family apartment and moves in with her parents, leaving Nader to care for Termeh and his increasingly helpless father. He hires Razieh (Sareh Bayet), a lower-class, chador-wearing woman, as a daytime caretaker for his father. Razieh, pregnant and desperate because of her unemployed husband's debts, struggles with the task of caring for the old man. She is deeply religious, and when the old man wets himself, she consults someone by phone to ask if it would be a sin to clean him. The situation escalates when Nader arrives home early one day to find Razieh gone, and his father sprawled on the bedroom floor, his wrists tied to the bed. When Razieh returns, Nader berates her and accuses her, unjustly, of stealing money (we have previously seen that Simin used the money to pay some movers). Enraged, he orders her to leave, and when she returns for her pay and to protest her innocence, Nader shoves her out the door, and she stumbles on the stairs.When it emerges that this act may have had serious consequences, Nader is drawn into a moral and legal nightmare, with Razieh's hot-tempered husband Houjat (Shahab Hosseini), bent on revenge and Nader's wife and daughter doubting his truthfulness. Witnesses are called. There are unanswered questions: Was Nader at fault, or was Razieh the victim of spousal abuse? Did Nader know that Razieh was pregnant (an important legal question under the system)? Will Simin move back in with Nader, as Termeh dearly hopes? Will Nader go to jail, or have to pay “blood money” to the family? With the exception of one sequence, in which a crucial piece of the story is elided in a way that could be considered a bit of a cheat, the narrative is seamless and intense, subtly highlighting issues of religious fundamentalism and class conflict in Iranian society.